Snoring can be a minor annoyance that occasionally leads to a poor night’s rest, or it can be a serious health issue. At Dinka Dental, we may be able to help stop snoring with anti-snoring appliances designed to reposition the jaw and tongue at night. Chronic snoring not only disrupts the sleep of the snorer and other family members, but it can also be a symptom of a serious condition called obstructive sleep apnea (OSA). OSA patients may have their breathing restricted many times per night when their airway closes due to poor positioning of the jaw and soft throat tissues. Snoring occurs as the patient automatically struggles to regain their normal breath. Snoring and sleep apnea are associated with health problems ranging from dry mouth, morning sore throats and headaches, and daytime sleepiness to serious cardiopulmonary conditions including high blood pressure and stroke. Simple anti-snoring appliances can alleviate these problems for many patients. Anti-snoring appliances are worn inside the mouth at night. Dinka Dental has had success with the Silent Nite® snore guard made by Glidewell Laboratories. This appliance actually moves the lower jaw forward, making more space in your airway. The result is a reduction of the vibrating soft tissues. These oral appliances are simple devices that keep the tongue from closing off the airway at the back of the throat and more elaborate devices that reposition the jaw in a forward and open position to maintain unrestricted airflow. The devices are comfortable to wear and do not interfere with sleep. 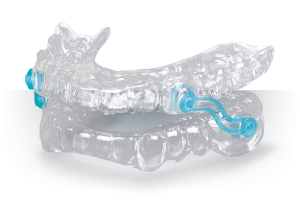 If one of these appliances is effective for you, it is a less expensive and less cumbersome treatment for your snoring or sleep apnea than a CPAP device or oral surgery. Call us at Dinka Dental to schedule a consultation. Our staff will do a complete evaluation of your snoring problem and will recommend the best approach to treatment.